We are so excited to share Lauren Mills of Mercy INK with you all this month for Authentic Motherhood. Lauren is the founder of Mercy INK a handmade shop as well as amazing blog which is amazingly encouraging and life giving! Lauren is incredibly real and honest in her balance of motherhood and her passions and I know you'll all be blessed by her beautiful heart. What is the mission behind MerckINK and how did it all begin? The heart of MERCY iNK the blog is to share bits of our life and faith, to advocate for those without a voice, and to encourage other women and moms to also step forward and use their lives and voices for good. The shop opened on Etsy back in November 2011. At the time I opened shop, I was excited to get some of my designs out there and have a little hobby of a business on the side, but I was still working full time as a social worker. A couple years in, and running the business and the blog became much more of a passion. Now, the shop has evolved and a big part of the mission is giving back. A portion of all sales are donated to a cause of the month. Can you tell us a little bit about your family? My pastor hubby, Adrian, and I met in college and have been married 9 years this month! While I grew up in Massachusetts, my husband's a southern guy and we now live in the Shenandoah Valley, Virginia. We have three kiddos at home, a 7 year old daughter and 5 and 3 year old boys. In January 2013, we began the process of adopting after years of prayer over it. Through lots more prayer, we were led to adopt from the Democratic Republic of the Congo, and are now waiting to bring our 2 year old daughter home. It's been a very full nine years, that's for sure! What have you found to be the biggest challenge in motherhood? I'm not sure if you've heard of the personality type "Highly Sensitive Person", but this is totally me. It basically refers to people that process sensory data more deeply and are more keenly aware of subtleties around them, which can often lead to feeling overwhelmed when too much is going on. While I love people, I'm definitely introverted and crave alone time. As you can imagine, it's challenging to be super sensitive, even bothered by too much going on in my environment, as a mother! It's almost ALWAYS loud and busy and wild in our house, and one of my greatest challenges in motherhood is just learning how to be careful about times for self-rest and quiet, even in tiny pockets, so I'm not totally flabbergasted or overwhelmed. 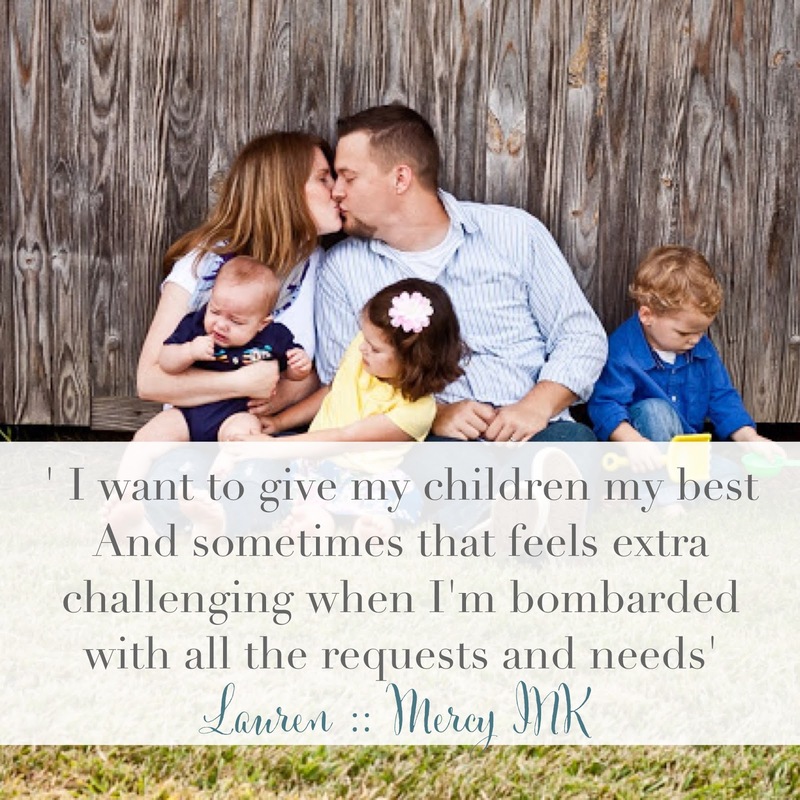 I want to give my children my best, and sometimes that feels extra challenging when I'm bombarded with all the requests and needs. It is such a treasure to discover each little child's unique personality. I love learning more about my kids and figuring out how they uniquely see the world. I also love seeing their child-like faith, and watching their little hearts respond to God's Word in the sweetest ways. How do you balance your blog life / business and family life? This is always going to be a bit of a juggle for me, but I have found it to be tremendously helpful to designate specific "spaces" or times that are for business and for family. This goes back to Question #3 above for me. While so many moms are rockstars at working from home with kiddos underfoot, I find that I am extra overwhelmed and stressed when my time is divided in that way. For us, this means that the little kiddos do go to pre-school part time at our church, and that is my designated work time. When they're home, I try my best to make that time family time, but business and family time do naturally overlap on many occasions. When I absolutely have to work on something while the kiddos are home, I've found a sweet spot in involving them in some way, like inviting them to help me package items or another similar task. Balancing work and family also means I need to be really intentional about putting the shop on vacation when we are away, and setting clear boundaries for myself so I can give the most to my family. 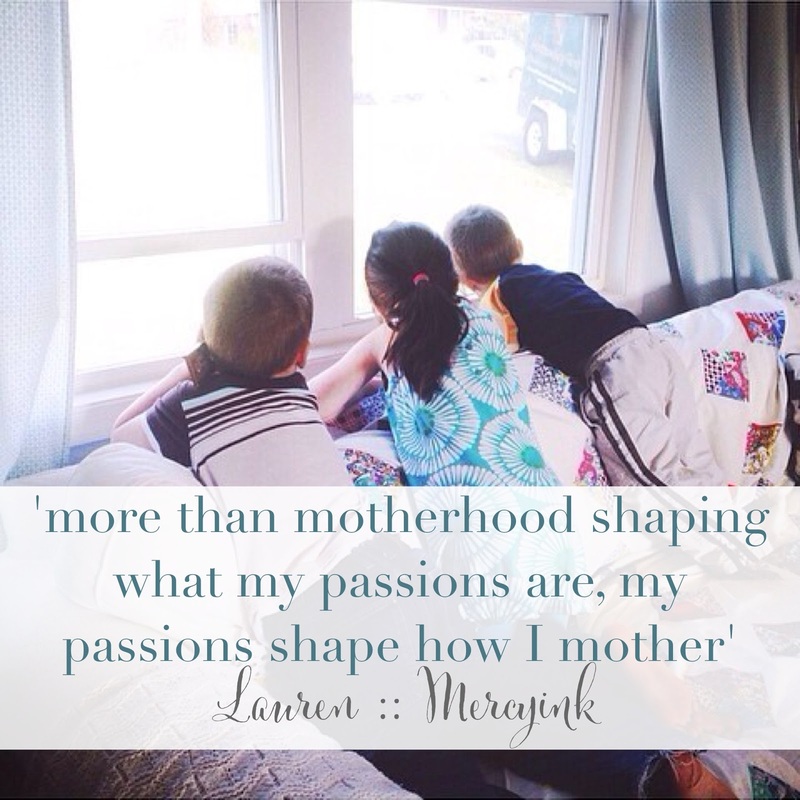 How is your motherhood affected by your passions? Wow, this is such an interesting question for me! My passions have really developed and shifted and evolved over the last seven years of motherhood for me. I am passionate about the "least of these" and justice and freedom and living life to the full in Christ, so I would say more than motherhood shaping what my passions are, my passions shape how I mother, if that makes sense. For instance, we are always talking about different cultures or places around the world with our kids and teaching them about some of the struggles that other people face. We find ways to serve together. For my son's fourth birthday, he decided totally on his own to collect change for clean water for people in a village in Guatemala where Adrian and I later traveled to dedicate a well. Those kinds of things get me really excited about living out my passions not only in front of my kids, but alongside them. What is one piece of advice you have for other moms who would like to live out their passions? I want to encourage other mamas that you can absolutely live out passions now, in the midst of motherhood, even if on the surface your passion does not naturally mesh with your parenting. 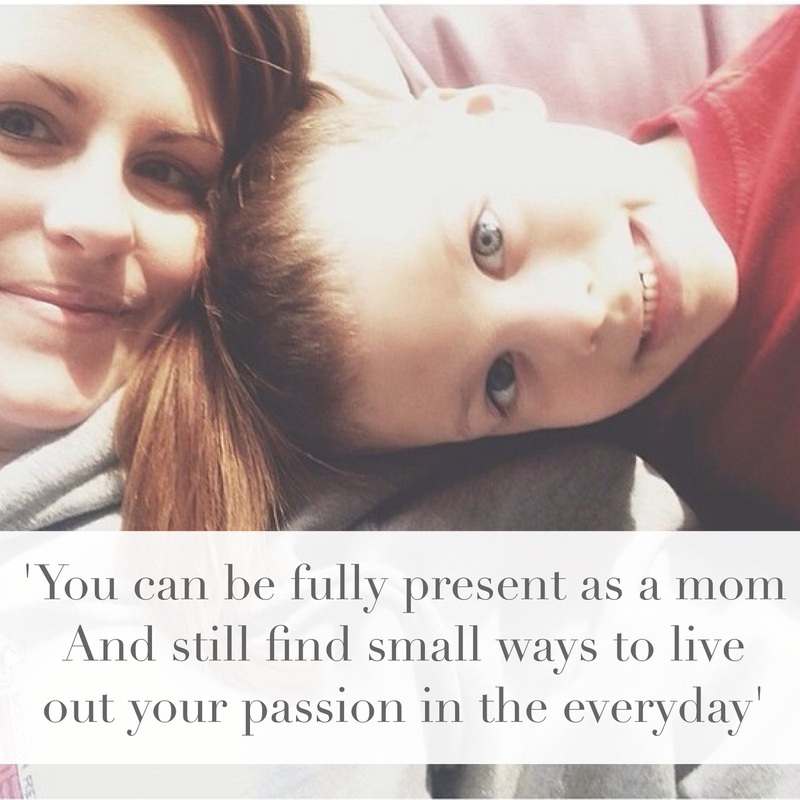 You can be fully present as a mom and still find small ways to live out your passion in the midst of your everyday. I believe you and your children will be better for it! // Thank you SO much for sharing with us Lauren!! Thats not all everyone!! 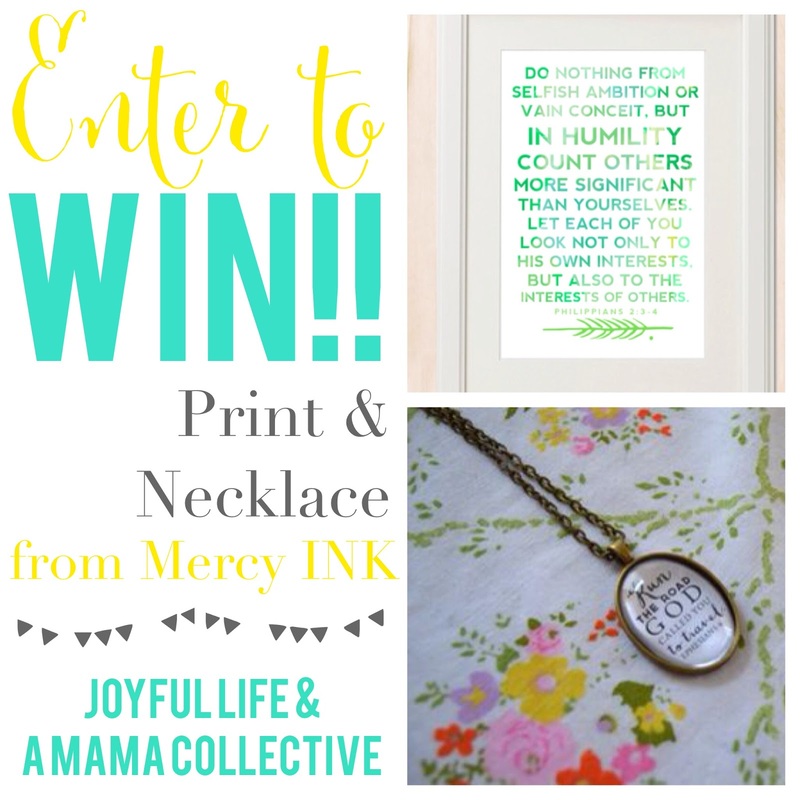 We are so blessed to have an amazing giveaway from Lauren's Shop Mercy INK. She is graciously offered a print and necklace of their choice to one lucky winner!! And guys these necklaces are GORGEOUS!! So get on it!